I call Marqués de Montroig, the main pedestrian street in Sitges the catwalk. This as the crowd pass by a row of different bars or cafés on their way to the beach. As they walk they pass a crowd of mostly gay males seated by the tables - watching! Pesquadito Tapas y Mariscos is one of these bars. 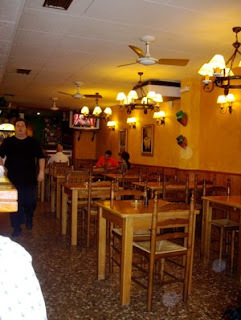 It was our first tapas experience in Sitges and probably the one we liked the least. And we have seen such tapas bars before. A slightly shabby oak interior, and very empty. The latter is an important indication whether you actually have found a good restaurant. My friend Øivind, an experienced diner stated that the amount of people and/or dust on the floor was an indication of quality. Much/many = good, or little / few = go elsewhere!! I know we went to get a snack on a time where most spaniards were between a substantial lunch and a late dinner. This could explain the fact that the place were nearly empty. The only snag was that the restaurants around had guests more or less the whole days (At least the ones that were popular). This as most visitors were non-nationals with their own dining habits. We should have followed Øivinds advice. Terje and I went in to have tapas, and I knew what to order - croquetas! My favorite snack, thick bechamel sauce with ham or cheese, cooled down - rolled in bread crumbs and deep fried. Hardly the most healthy choice, but oink, oink!!! Croquetas are served in Belgium as well, here called croquettes (ofcourse). Here they make Croquettes de Fromage (cheese) and jambon (ham), as in Spain. In Belgium they also make croquette from "des crevette grises", i.e. small grey prawns, the latter delicious!! 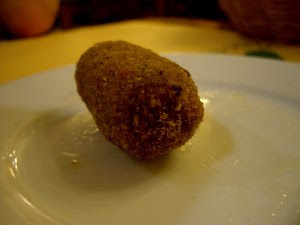 The croquetas at Pescaditos did not taste very much of what it was supposed to be made of - ham. They were a little greasy as well. A little rest on some kitchen paper before serving would have been a great idea. 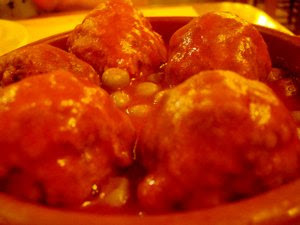 I think calamaris is one of the original tapas dishes, i.e. what was served as free snacks in Spanish bars before it became trendy and they started to serve them for money. When well prepared, calamaris is delicious. Crispy on the outside, and soft and tender on the inside - two contrasting textures and tastes. Squeeze over some lemon and tuck in. 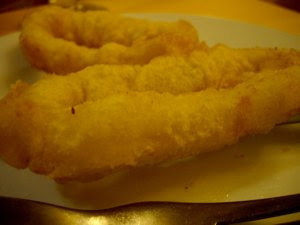 The calamares served at Pesquaditos were coated in too much batter thus ending up greasy. The calamares were also a little rubbery. Another favorite, or at least when well prepared. You may find me grumpy or hard to please, but we both agreed that we had eaten better elsewhere. Both the meatballs and the sauce had a flat and uninteresting taste. The meatballs should have had amounts of garlic to scare the devil away, and the sauce should have been sweet and salty, with Mediterranean herbs. Should have been - should have had, as they had neither. But there were small green peas in the sauce - fancy! 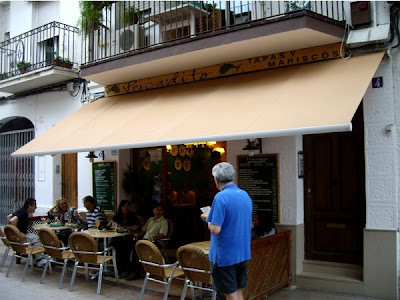 A piece of advice - try the other tapas restaurants. May I recommend Pintxos at Izarra, or Bianco, the latter over priced but my how much taste. More on these later here on Enjoy Food & Travel.